Many of us are lacking important vitamins, minerals and enzymes in our everyday diets. Why is this? Let me share with you some reasons that even the BEST diet purchased from our stores would still need supplementation. Current techniques used in our commercial agriculture leave the soil deficient in important minerals, in turn, causing the food that is grown in that soil, to also be deficient in the same minerals. The ways in which our foods are handled and stored for long periods of time, depletes the vitamins found in these foods, especially the complex B and C vitamins. Processing, preserving, and cooking alone leads to nutrition depletion of our foods. Many of our fruits and vegetables have been genetically modified to increase the shelf life, appeal and crop yield, and in doing so, has decreased the nutritional value originally found in these foods. Poor eating habits such as eating fast (not completely chewing our food), eating on the go, and increase stress decreases the breakdown and digestion of food, making it impossible for our bodies to absorb all the nutrients. Increase in Medication use causes a depletion of our essential nutrients. LIFE. Different times in our lives call for higher levels of certain nutrients. When pregnant woman may need more folic acid, as woman age they may need higher levels of calcium. Just like the oils that come from Young Living, the supplements that they provide are of the highest quality on the market. They put a great deal into the research to be sure that they are using the highest, best quality plants, that are bioavailable and able to be absorbed into our bodies. They are strictly organic, no GMO’s, No hybrids, and come from very specific regions with nutrient rich soil. What is even more amazing is the absorption of these supplements. If you were to take the highest quality supplement out on the market, the highest level of absorption that you may get is about 30-35% absorption into your body. The rest is excreted in our waste and urine. However, studies have shown that by adding the essential oils to the supplements that Young Living offers, the absorption rate goes up to 80-85%!! That is a HUGE difference. The reason for that is the way in which the oils work on the human cells making them more able to receive and absorb the nutrients. Young Living has over 50 different supplements, but I will just go over the ones I use daily. preserve the molecular framework of connective tissue. Helps us create glutathione. Glutathione helps to remove toxins from our body. Most toxins are stored in our fat tissues. Glutathione helps those toxins switch over into the water in our system. They are then in turn removed and excreted through our kidneys and urine, instead of stored for years building up in our fat tissue. How many times do we hear that we need to drink our greens!! We need to eat our greens!! I know for a fact that I do not get enough of the deep dark greens that I need in my diet. I am not much of a fan of the drinks AT ALL. 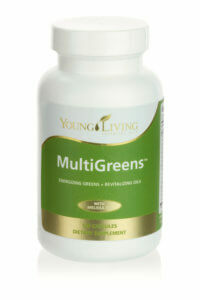 This is my greens in a capsule form!! NO mess, NO taste! It contains ingredients that help cleanse the blood and support the immune, thyroid, and digestive systems to relieve stress, and promote energy metabolism and glucose utilization. Spirulina is a source of chlorophyll, a magnesium-rich pigment that has been linked to improved energy and metabolism. Spirulina has been used as a tonic, purifier, and detoxifier. It targets the immune system, liver, kidneys, blood, intestinal flora, and cardiovascular systems. Barley grass juice concentrate is an antioxidant that is rich in minerals. Bee pollen is high in protein and low in fat and sodium. It is loaded with vitamins and minerals, including potassium, calcium, magnesium, zinc, manganese, copper, and B vitamins. Eleuthero root, also known as Siberian Ginseng Root, enhances physical and mental vitality and endurance. L-arginine is an amino acid that promotes circulation in the small capillaries of our tissues, allowing greater nutrient absorption and cellular metabolism. L-cystine is an amino acid that supports healthy liver function and hair. L-tyrosine supports the formation of neuro-transmitters, such as dopamine and serotonin. Choline bitartrate supports your brain and liver to function properly. Kelp contains iodine that helps keep thyroid hormonal balance, and estrogen balance. Lemon supports the immune system, kidneys and liver health. Lemongrass helps promotes healthy digestion. Rosemary CT cineol helps balance the endocrine system. OmegaGize from Young Living is the perfect combo of 3 core essentials. 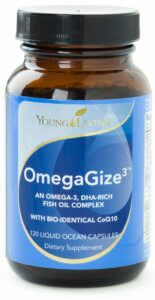 This supplement contains omega 3 fatty acids (DHA rich fish oil), Vitamin D3 and CoQ10 (ubiquinone). Young Living goes to great lengths to ensure that they can source the purest fish oils available. Their fish oil is harvested from small fish in pristine waters and is free of heavy metals, PCBs and dioxins, surpassing industry standards for purity.The ingredients are excellent and work together to support your brain, cardiovascular system, eyes, and joints. German Chamomile essential oil is helpful in supporting the liver and gallbladder. It is also a calming essential oil. Spearmint essential oil contains naturally occurring properties including carvone, menthol and limonene (check out google for details on these constituents). Clove essential oil retards oxidation of the fish oil (fish oil can oxidize and become rancid quickly) and kills off any bacteria making it a more stable supplement. Why Omegas? When it comes to fat, there’s one type you don’t want to cut back on: omega-3 fatty acids. Two crucial ones — EPA and DHA — are primarily found in certain fish. ALA (alpha-linolenic acid), another omega-3 fatty acid, is found in plant sources such as nuts and seeds. Your body needs these fatty acids to function. Vitamin D3? Did you know that we have a Vitamin D deficiency epidemic? Having adequate levels of Vitamin D is shown to reduce many risk factors. Vitamin D3 (Cholacalciferol) – Is a fat soluable vitamin that is known to support the absorption of calcium and phosphorus, support healthy circulation, supports a stable mood, and neuromuscular function. The only Vitamin the body manufactures from sunlight! Most multivitamin supplements only contain 400 IU of Vitamin D. This is not going to help increase D3 levels. Promotes optimal gum and oral health. increases internal enzyme reactions that control circulation, hormone levels and overall health. Aids in normal digestive function. 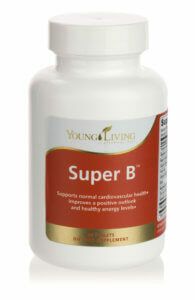 The benefits of Super B are wide reaching, and they not only affect your physical health, but also your overall outlook of life! 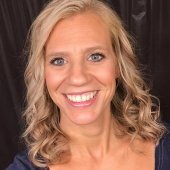 B vitamins are essential to our health and well-being, and each B vitamin performs a unique and separate function in the body and they must be replenished daily, as they are not stored in the body. Vitamin C has been the most researched nutrient than any other nutrient. It is one of the most important vitamins required by our bodies. So what all does vitamin C do for us? Maintains healthy cartilage, bones, and teeth. TAKE THIS EVERY DAY PEOPLE! AND LAST BUT NOT LEAST!!!!!! The liquid essential oil capsule contains: tumeric, cardamom, fennel, ginger, and clove essential oils, also contains your fat soluble vitamins: A,D,E, & K and a unique vegan form of Vitamin D3 (Vitashine), a bioavailable form of Vitamin K and Vitamin A is from beta carotene. The micronized nutrient capsule features an organic blend of B Vitamins, except for B12 which is the methylated form. Plus Biotin, Pantothenic Acid, Magnesium, Zinc, Selenium, Copper, Manganese, Chromium, and Molybdenum. The second contains a powdered capsule proprietary blend including Atlantic kept, Inositol, PABA, Lycopene, Spirulina algae, and Barley. The phytocaplet contains antioxidant ingredients and Vitamin C. It includes the proprietary blend of Spectra® which is made up of fruits, vegetables and herbal extracts including coffee arabica fruit extract, broccoli sprout concentrate, onion, and apple extract. Also including the concentrates of tomato, broccoli, acai, garlic, basil, tumeric, oregano, cinnamon, elderberry, carrot, mangosteen, blackcurrant, blueberry sweet cherry, blackberry, chokeberry, billberry, acerola, camu camu, and brussel sprout. 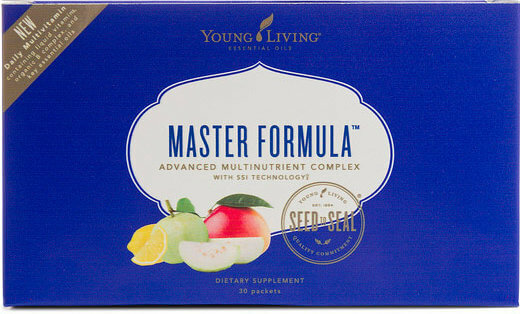 Master Formula also contains gut flora supporting pre-biotics this is what helps your probiotic (Young Living’s Life 9) work even better. Probiotics assist in maintaining digestive health. Contains ingredients to help neutralize free radicals in the body and includes antioxidants, vitamins, minerals, and other food-based nutrients. 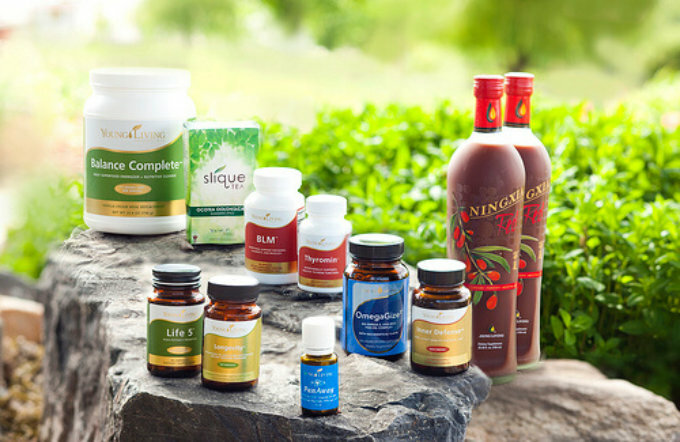 This nutritional powerhouse features 55 different natural botanical sources including NingXia wolfberry. There You Have It People, That Is My Daily Lineup! 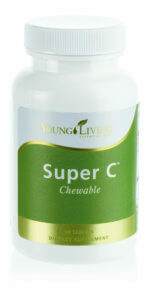 Do you know if YoungLiving Super C chewable vitamins are water or fat soluble?